An annual favourite, offering 150 complete sermons for the coming year, with hymn suggestions. For each Sunday of the year there are two sermons, plus material for festivals, saints' days, baptisms, weddings and funerals. 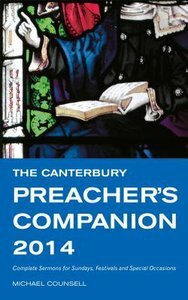 About "The Canterbury Preacher's Companion 2014"
This loose-leaf A5 personal organiser edition of the bestselling church desk diary provides one page per weekday and a double page spread for Sundays, making it ideal for advance planning and day-to-day working. Readings from the Common Worship and BCP are listed for each day and on Sundays, Holy Days and major Saints' days, the Common Worship collects and sentences are printed out in full. Its many extra features include extensive national and diocesan church information, lists of organisations, table of fees, accounts section, a two-year planner, sunrise and sunset times, plus ample space for recording personal information. Michael Counsell is the compiler of numerous prayer collections, including "Prayers for Sundays" and "2000 Years of Prayer".